Master Chineke Cajethan Goodluck hails from Agbariji Inyi under Oji River Local Government Area of Enugu State. The young Cajethan Participated in 31 different academic national and international competitions and came out first place winner in 30 competitions. In 2009, he participated and won all primary schools quiz challenge, emerging 1st five times in different categories and the next year, he took 1st and 2nd in ANCOPPS quiz competition. He won 1st position five consecutive times in “All Niger State quiz competition for junior secondary schools at all stages. In 2012, he emerged 1st position in the NYSC essay competition at Oji River Local Government, the following year, he emerged 1st five times in the Hon. Tobias Okechukwu debating competition in Enugu State at all levels. Goodluck later won a gift from Goi-Peace Foundation in 2014 and, came 1st three times in the ASWANS National Essay Competition after which he was given award as “Nigeria Most Innovative and Creative Student 2015”. 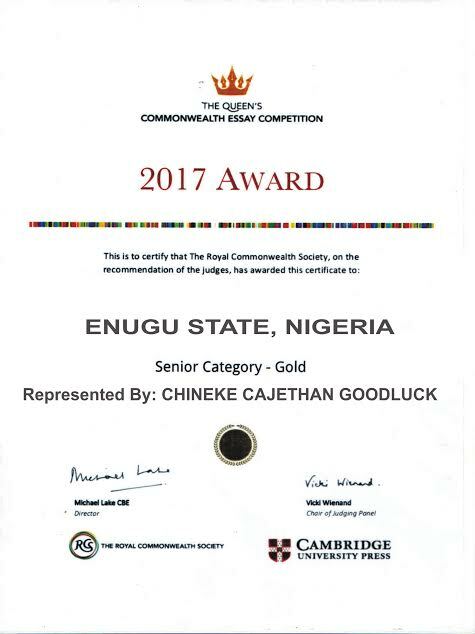 The same 2015, the Inyi Born genius, son of Enugu State and Nigerian citizen won gold twice in the Commonwealth Essay Competition in Nigeria and Africa and got bronze at the world level which all the youths around the world took part. Coming to 2017, Cajethan was sent to represent his university (Peaceland College, Enugu) for the “Western African All Universities Debating Championship”, which was held at the University of Calabar, Cross – River State. Cajethan still came back with award naming the school as the best debating institution in West Africa 2017. In June, 2018, Chineke Cajethan received a certificate of Excellence from UNESCO-GOI-PEACE for motivating young ones to participate in academic competitions. Amb. 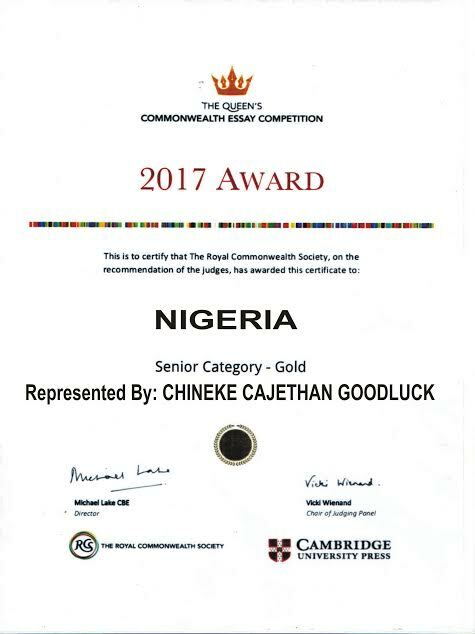 Chineke Cajethan Goodluck was later invited to meet the Queen of England, other leaders of the World during the Commonwealth Heads of Government Meeting held from the 16th -18th April, 2018 in London after winning another Gold award which attracted more than 13 thousand youths across the world. The young Nigerian missed the opportunity as a result of no support especially from the state government. 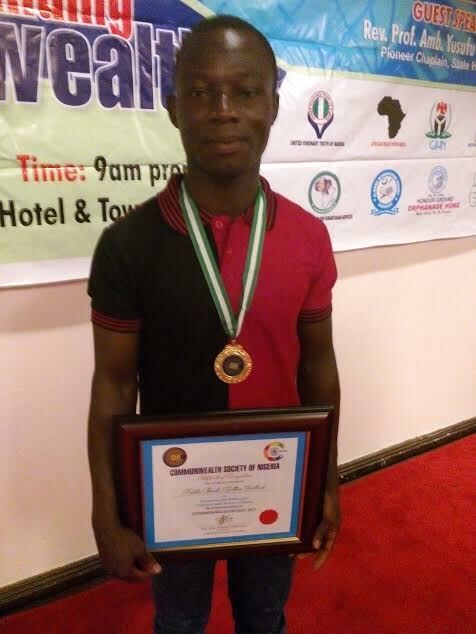 The awards winning citizen has written series of letter to the Enugu state government after which he was invited in one of the state EXCO meeting and was promised to receive feedback they never fulfilled until the deadline of the invitation passed. The Secretary General of Commonwealth Society of Nigeria who charted with the state commissioner for education appealed to the state government to do their part and leave the rest for them but all was in vain. Principal of his Alma Mata who pleaded anonymity during a phone chat, described Goodluck as “not only a lucky chap, but brilliant minded that has made the school proud throughout his career in secondary school. While the Dean of Student Affairs of his University described him as an “extra ordinary student as his performances since he was admitted in the College is too high. To sum of it up, the Goodluck is a 100 level student of English and Literary Studies that he is using this medium to solicit from the good people of this country who believe in their own of his talents that the end, he will be an asset to the country. Covered by Dream F.M, Enugu.